Grace Cottage in Bamburgh is a beautiful property with a lovely far reaching sea view is perfectly located in the upmarket coastal village of Bamburgh in Northumberland, with its good range of restaurants, pubs, shops, the superb Grace Darling museum and the famous beach and castle – all in easy walking distance. Grace Cottage in Bamburgh has 2 bedrooms and 2 bathrooms, a large wood burning stove and views out towards the sea and Holy Island, this tranquil holiday home is just 200 yards from the main street of Bamburgh – close enough to walk to a restaurant for dinner or a pub for a drink, yet far enough away from the hustle and bustle of this vibrant little village. Located within West House, a beautiful Georgian country house, it has a large and beautifully maintained shared garden with summerhouse, private parking and is conveniently all on one level. 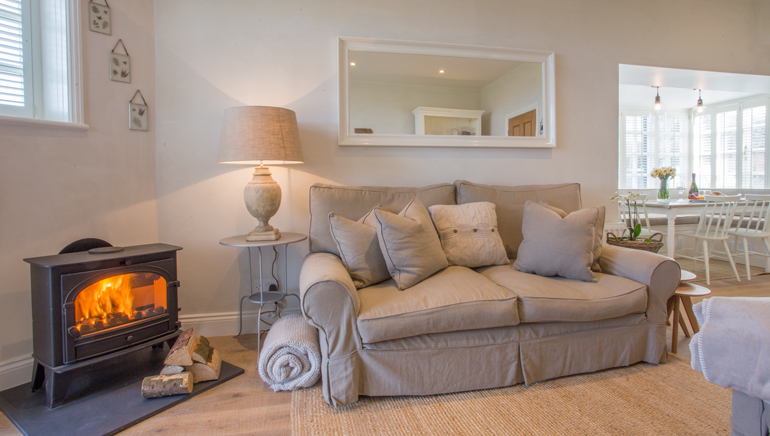 Grace Cottage has been awarded 4 stars with a prestigious Gold award from VisitEngland for it’s high standard throughout, using a soothing Farrow and Ball colour palette throughout the house to bring an air of calm and tranquility – perfect for a relaxing coastal holiday. Framed by the magnificent castle, Bamburgh has a multitude of pretty gift shops, great fish restaurants and welcoming Northumbrian pubs, as well as a picture-perfect sandy beach, wrapping around the iconic castle. Bamburgh beach has been used for the backdrop for many famous films including the BFG, Beowulf, The Transformers and Macbeth. During the spring and summer months, you can watch the village cricketers play matches against rival villages on the expansive bowling green, with the backdrop of the magnificent castle in the background. Round the day off with a Doddington’s ice cream from Wyndenwell cafe – the perfect British pastime! The cottage acquired it’s name from a famous local heroine, Grace Darling, who rowed out to sea in a treacherous storm to rescue seaman and passengers of the stricken SS Forfarshire back in the 1800’s. The excellent and unmissable Grace Darling Museum is just a few yards from Grace Cottage and is really interesting to visit whilst staying in Bamburgh. Grace Cottage is located within an impressive period house; ‘West House’, and offers spacious and luxurious accommodation for up to 4 guests in 2 bedrooms with 2 bathrooms; one king size room (5ft wide bed) and one twin bedroom (3ft wide single beds) that can be converted into a super king size bed upon request (6ft wide). A family bathroom in addition to an en suite shower room to the master bedroom provides private facilities for both bedrooms. The accommodation is all on one level with the dining area, kitchen and lounge all open plan, benefiting from the beautiful views of the coastline from the pretty windows dressed with beautiful wooden plantation shutters. There is a well-maintained garden, shared with the other residents of West House, as well as private parking for the cottage. 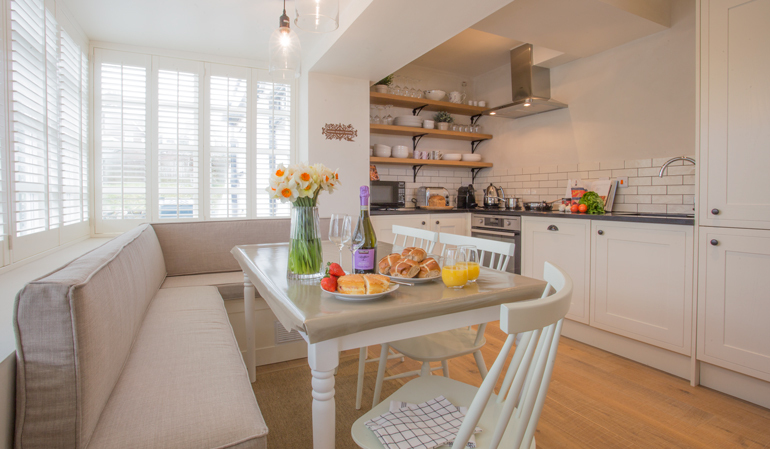 Grace Cottage is pet-free and wi-fi is available throughout. The entrance into Grace Cottage is through the original front door to West House. You enter into a small lobby which leads to each of the two bedrooms and the family bathroom. The open plan living area is located at the front of the cottage, offering a pretty view. The lounge is cosy, comfortable and luxurious. 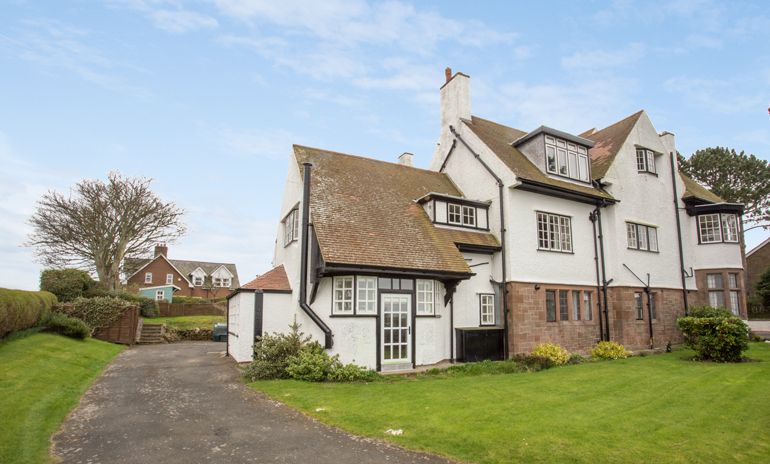 The wood burning stove is perfect for providing extra ambiance in the cooler months, and the main focus in the lounge is the lovely distant view out to sea and to Holy Island. Each of the windows are framed with beautiful wooden plantation shutters and there is a glass door that opens out to the front garden of the cottage. Comfortable sofas provide seating for 4. There is a large Smart TV with Freeview, BT Sport and Netflix, Bluetooth speaker and a selection of books and games. An initial supply of logs is provided for the wood-burning stove between October and April. The well-equipped kitchen/dining room is cosy and full of character, with windows and wooden shutters framing the bespoke ‘booth’ dining area. The kitchen has granite work tops, a large larder for storage, fridge, freezer, a single electric oven, ceramic hob, Bosch dishwasher, microwave, Dualit toaster and kettle, and Nespresso coffee machine (initial supply of pods provided). Washer/dryer. The master bedroom is luxurious, with a king size bed (5ft wide), wall-mounted Smart TV with Freeview and Netflix. Plenty of storage, luxury White Company linens, fluffy white towels and a hair dryer. 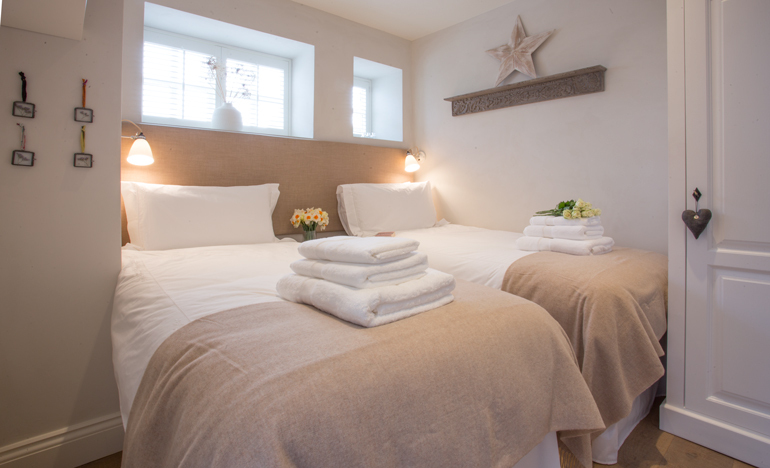 The en suite shower room has a large, walk in shower, WC and basin, with underfloor heating. The second bedroom has twin single beds (3ft wide) that can be converted into a super king size bed (6ft wide) upon request. Please select this on your booking form. There is a wall-mounted Smart TV with Freeview and Netflix. Luxury White Company linens, fluffy white towels, hair dryer and plenty of storage. 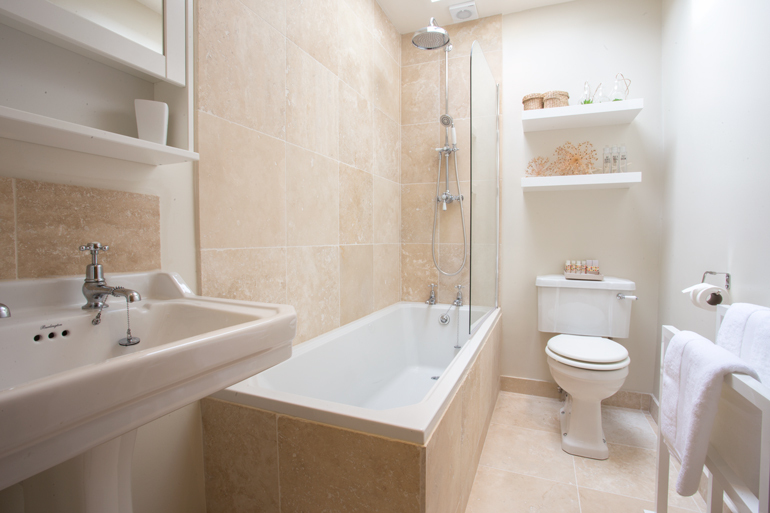 A gorgeous bathroom with underfloor heating, a bath with mains shower over, WC and wash hand basin. Towels and complimentary toiletries by Orla Keely provided. Natural, earthy tones, stylish fabrics and white washed walls all create a luxurious modern village home with a designer edge. The quirky features and objet d’art add character and flare to the cottage and the wood burning stove ensures it’s comfortable and cosy. Up to 4 guests and 1 baby welcome. 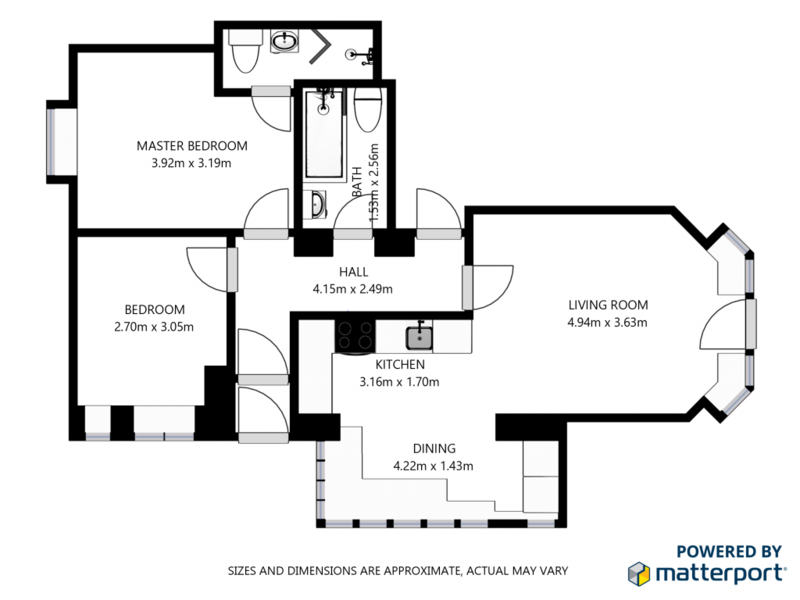 One bedroom with a king-size (5ft wide) bed and a second bedroom with twin single beds (3ft wide) which can be converted to a superking double (6ft wide) upon request. One baby welcome. Travel cot and highchair available upon request (bring own cot linen). 2 bedrooms; one king size room (5ft wide bed) and one twin bedroom with single size beds (3ft wide) that can be converted into a super king size (6ft wide). 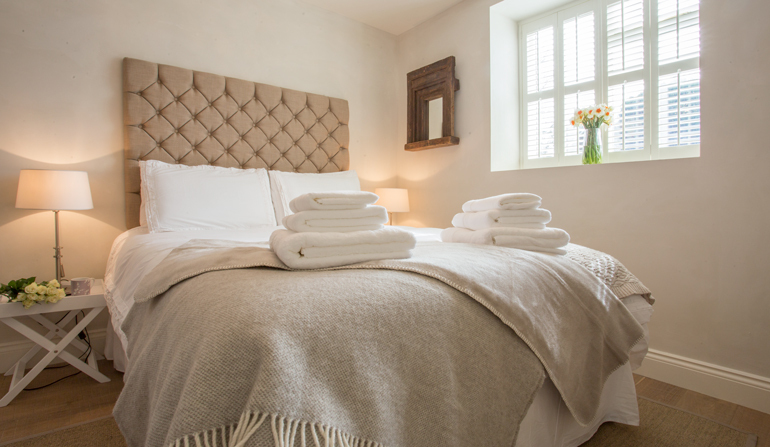 Luxury White Company bed linen and white towels provided. Travel cot available upon request (bring your own cot linen). Synthetic bedding and pillows are provided in the master bedroom. Synthetic duvet and feathered pillows are provided in the second. 1 en-suite shower room with a large walk-in shower, WC and basin. Additional bathroom with bath, shower over, wash hand basin and WC. Complimentary toiletries by Orla Kiely. There is private, off-road parking for two cars at Grace Cottage. Grace Cottage has shared use of the well-maintained and pretty gardens with the other residents of West House. There is a lovely summerhouse and also a front garden from which the French windows in the lounge open out onto (garden not enclosed). There is no BBQ provided at Grace Cottage. Central location with all village amenities less than 2 minutes’ walk away. 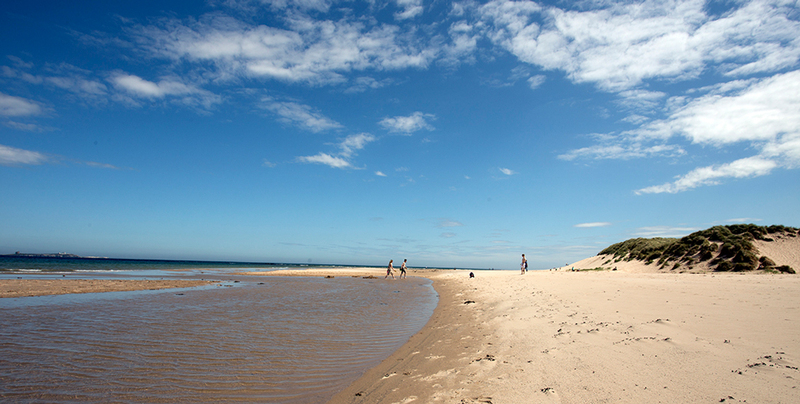 Other nearby villages such as Seahouses and Beadnell are within a few minute’s drive. 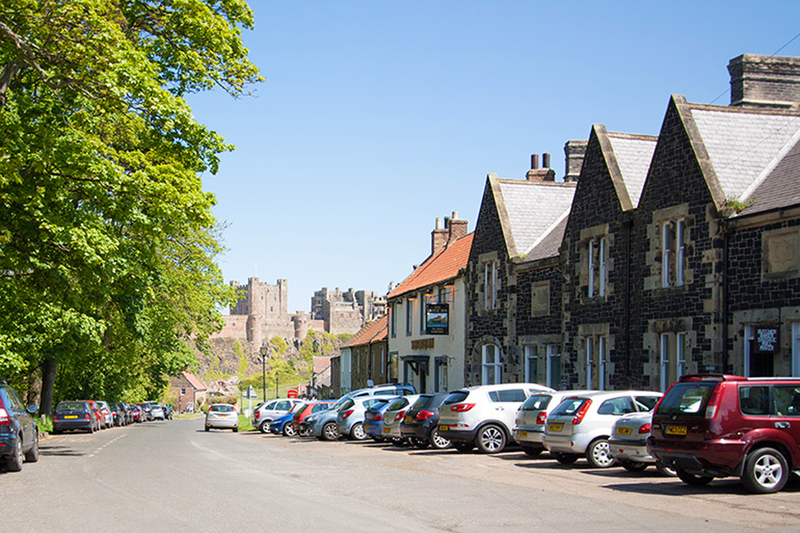 Boutique shops, luxury pubs, restaurants, pretty cafe’s and a deli all just minutes away on foot, as well as iconic Bamburgh Castle and huge sandy beach. Sorry no pets can be accommodated at Grace Cottage. Fridge/freezer, electric oven and hob, microwave, dishwasher, toaster and kettle. Nespresso coffee machine. Washing machine, iron, ironing board and vacuum. Hairdryer, books & Netflix films. Dining table seats 6. Full central heating throughout the cottage. Underfloor heating in the bathrooms. Smart TV’s with Freeview and Netflix in the lounge and both bedrooms with BT Sport available in the lounge. Free BT Infinity wi-fi throughout the cottage. Selection of books and games for more traditional pastimes. With all accommodation on one level and level access from the front door as well as a walk-in shower, this cottage is well suited to those with limited mobility. Welcome Hamper including luxury Orla Kiely toiletries, bespoke Property and Area guide. Shared use of the gardens and summerhouse. Wood burning stove. An initial basket of logs will be provided for holidays taken between October and end of April. Further supplies may be purchased at the Co-op in nearby Seahouses. Here is a virtual tour and floor plan of Grace Cottage. The virtual tour allows you to ‘virtually’ walk around the cottage and see all areas. The floor plan is not guaranteed to be totally to scale or be 100% accurate, but is shown here to give you an idea of the general layout of the cottage. Click on the floor plan to enlarge it. Bamburgh is a gorgeous village, with dog-friendly pubs, pretty shops and the famous award-winning ‘Carter and Sons’ butchers, famous for their ‘Bamburgh Banger’. As well as the famous castle, there is also a huge beach which wraps around the bottom of the village and is dog friendly all year round. During the spring and summer months, you can watch the village cricketers play their matches against rival villages on the expansive bowling green, with the backdrop of the castle in the background. Grace Cottage is just on the edge of this pretty village, just a couple of minutes easy walk to the heart of the village. Seahouses is just 3 miles south, where you can catch the boat trips over to the Farne Islands and watch the daily catches come in at the harbour, then treat yourself to some of the best and freshest fish and chips in the country! Beautiful Budle Bay is just 5 minutes to the north – a birdwatcher’s paradise! Holy Island is to the north (about 20 ins in the car) where you can visit Lindisfarne and the history-rich island. Watch out for those tide times though! You can explore the location of Grace Cottage on the map below which gives you a good idea of the area. The postcode of the property is NE69 7AE. To find out the distance from your own home to Grace Cottage, how long it will take to drive there and other options for alternative transport, click here: Grace Cottage on Googlemaps and enter your home postcode in the box provided. This is definitely the most beautiful and well quipped holiday cottage we have ever stayed in! We will definitely be back. Bamburgh is gorgeous! Dine at The Potted Lobster for a real coastal village experience. With the catch of the day from Seahouses, prepared beautifully, and on to your plate – Seafood doesn’t get much fresher than this! The restaurant has a great atmosphere, and is incredibly popular with locals and holiday makers alike so be sure to book! Take a boat tour out to the Farne Islands with Billy Shiel’s boat trips. This is a must when you come to Northumberland, especially as you are so close to Seahouses. The tours leave from Seahouses harbour and sail all around the Farne Islands. Some stop at the islands where you can get off the boat and have a tour by one of the local rangers, and each boat tour differs depending on the season and what is nesting/breeding around the island. Billy Shiel’s tours are the largest operator in the town, still ran by all the members of the Shiel family who are the most knowledgeable about the area. Make sure you book in advance as they are incredibly popular, especially after being featured on the well known TV series ‘Tales from Northumberland’ with Robson Green. Take a walk out from the cottage and head over the dunes to stunning Bamburgh Beach and take in the breath-taking views of the castle, nestled in the dunes on the headlands. This place is a photographer’s dream, especially if you manage to catch a sunrise!